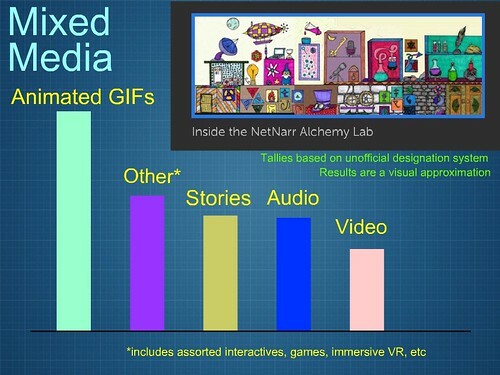 As I write this, a week after launching the Alchemy Lab of Digital Objects, I am looking at stats for the immersive space. The space has been visited nearly 300 times and objects within the lab itself have been “clicks/viewed” nearly 700 times. Not everything worth writing about is data-driven, but at least, the numbers show us that people are giving the Lab a look, which is satisfying. The other day, I posted the first of a series of reflections about digital storytelling and media creation. 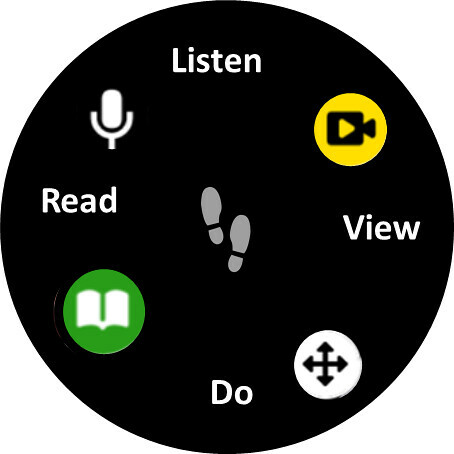 Yesterday, I posted about collaboration, participation and the platform technology. Today, I am reflecting on what might happen next with the Alchemy Lab after writing about the experience of making a vision become a reality (even if the reality didn’t quite reach the vision.) We had nearly 20 people, making nearly 50 digital media pieces in the Lab. A side note: the building of the Lab is part of an open project within Networked Narratives, a course being taught in the US by Alan Levine and in Norway by Mia Zamora. This is the second iteration of NetNarr, and I am part of the “open wild” of Networked Narratives — which means I don’t have to do any homework I don’t wanna do, and I can ignore Mia and Alan whenever I want. It’s great! In this post, I want to think out loud about further possibilities. When we constructed the Alchemy Lab project, we wanted a “doorway” in and a “doorway” out. This entailed a lot of conversation early on, about how such doorways might help the narrative flow of the project. Again, we struggled with a cohesive storytelling narrative. In the end, we created a website entry point and, if you click on the E on the ceiling of the Lab, you can find an exit point to another website. Here, Wendy set up a checklist of objects, in hopes that a visitor might realize they might have missed something and gone back into the Lab. We also set up a MediaJumping Padlet site, inviting visitors to the Lab to remix or make their own art. We’re still hoping ..
Todd also shared a bunch of links and an invitation to keep creativity flowing, with links to DS106 and CLMOOC and more. The idea is that the Lab is merely a stepping stone, leading to other collaborations and creativity projects. Some of the chatter behind the scenes once the Lab was released was about reaction of offline work colleagues to the shared Alchemy Lab, and that had me thinking about how I can best share this project with my sixth grade students. What might 11 year old writers think of Mr. H’s crazy project? More than that, how could I have my students contribute to a similar project? Luckily, we have the originals of everything we used — from Susan’s artwork, to the ThingLink 360 account, to the signing up forms, to the Twine invite, and more — and all can be adapted. I am thinking of trying to get my students into the Lab before we head off on April break next week … and reconstructing the lab during our unit on poetry. What about if they choose an object, write poems about it (and maybe create media), and then rebuilt the lab as a space where Every Object Is a Poem? Could this process inspire people to develop similar platforms with student and adult contributors from around the world posting media and art that creates awareness and understanding of problems in different places, points to solutions working in some places that could be duplicated in other places, points to challenges of finding resources, and provides an invitation for others to draw from the work done to support local problem solving, while also adding their own ideas in the future. Daniel, Thank you for reading and for responding (as you often do). Your message of collaboration to solve problems … I agree, and hope different models inspire different kinds of action.